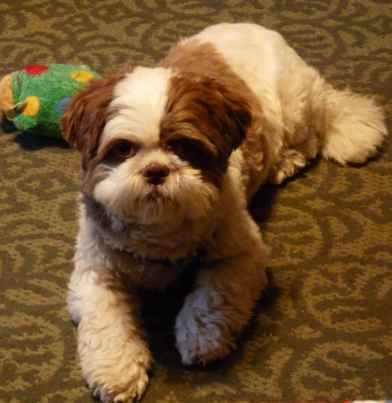 The history of the Shih Tzu is an interesting one, however somewhat controversial. It is believed the ancestors of the modern Shih Tzu may have originated from Tibet as early as 600 AD, and are one of the oldest dog breeds in the world. Some people think the Shih Tzu was created by crossing Lhasa Apso's, (if you have ever seen an Apso you will definitely see this resemblance) with Pekinese, while others adamantly disagree. The truth is still unclear, but what is generally accepted is the Tibetan holy dogs are the ancestors of today’s Shih Tzu. Although mostly thought to have originated in China, some breed journals indicate their ancestors were given as gifts to the Chinese imperial courts from the Tibetan Dalai Lamas. We all love a fascinating story and the Shih Tzu is certainly one of those good, hard to believe magical ones that leave us wondering if it could possibly be true. Shih Tzu, when translated in Mandarin mean "lion" and lions as it were, held a significant importance in the Buddhist religion. They were considered sacred beasts of Buddha. But since lions are not indigenous to the Far East, the Shih Tzu were bred to resemble lions and took their place as a religious symbol. 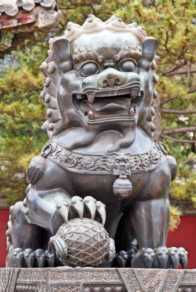 Huge stone lion dogs, like the one you see here, guarded palace doors, many temples and public buildings. The legend is that Buddha had a Shih Tzu that was his constant companion, and this little dog would transform itself into a lion which Buddha rode upon. The Shih Tzu are considered "lion dogs" but the truth is that there are several breeds which were bred to resemble small lions. Although the history of Shih Tzu is not entirely clear, what is known is that they were highly valued by the Empress Dowager Cixi, the most important woman in Chinese history, during her reign in the 19th century, and she instructed the court eunuchs to maintain their breeding until her death in the early 1900’s. This turned out to be very important to the survival of the Shih Tzu breed, whereas when the communists came to power in 1949, they were viewed as a symbol of wealth and privilege and also a drain on resources, and were eventually all destroyed. The Shih Tzu history would have ended there, were it not for the breeding done by those three women who brought them to the western world. It’s said that all of the Shih Tzu today are descended from those few dogs. It’s a sad thought to think we may have not been graced with these precious little lion dogs, had it not been for these saved few.